Kathleen Cameron, a personal friend of mine, a great birder and bird photographer has been hosting birding tours to Costa Rica for a few years now. She recently led a tour to Peru too. On her Costa Rican tours, they have been averaging right around 400 species. Often more. I'm just saving up to go on one of these tours myself. 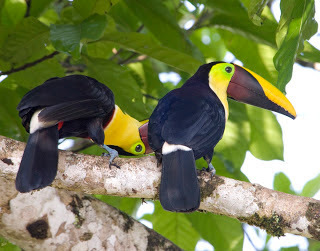 If you're interested in a wonderful Costa Rica birding and ecotoursim adventure with Majestic Feathers in March 2013, click here for details. Tell Kathleen that Robert from "Birding is Fun!" sent ya!